Nat the cat can sleep anywhere and any way—but can he sleep through the antics of a rambunctious kitten? Find out in Victoria Allenby and Tara Anderson’s award-winning book, perfect for bedtime and story time! Based on extensive interviews with a young woman forced to flee Iran because of her sexual orientation, Moon at Nine enters an important conversation about social justice and human rights at a critical time. Internationally acclaimed author and humanitarian Deborah Ellis (The Breadwinner) brings her usual grace and sensitivity to a challenging issue, telling a haunting true story that will leave no reader unmoved. The Retail Council of Canada has announced its longlists for the 2014 Libris Awards celebrating excellence in the Canadian book industry. We are honoured that our country’s bookselling community has nominated Pajama Press in the category of Small Press Publisher of the Year. The Libris Awards honour outstanding contributions in a range of categories. The shortlists in each category will be decided in April, with the final winners announced at the Libris Awards Gala on June 2nd. We are so proud to see our company name alongside so many outstanding presses, authors, booksellers, sales representatives, and our own distributor, University of Toronto Press. Click here to view the longlists in each category. Pajama press is proud to announce that Cat Champions: Caring for our Feline Friends by Rob Laidlaw has been nominated for the 2014/2015 Hackmatack Children’s Choice Book Award. This award is an annual reading program that encourages literacy and the love of reading among children in grades 4, 5, and 6 in Atlantic Canada. The companion book to Cat Champions, No Shelter Here: Making the World a Kinder Place for Dogs, is nominated for the 2013/2014 award; those results will be announced later this spring. Learn more at www.hackmatack.ca. Congratulations to Rob and to all of the nominated authors! Pajama Press is proud to announce that three of our titles have been shortlisted for the 2014 Canadian Library Association Awards. The Stowaways by Meghan Marentette, with illustrations by Dean Griffiths, has been shortlisted for the Book of the Year for Children Award. Graffiti Knight by Karen Bass and Nix Minus One by Jill MacLean have both been shortlisted for the Young Adult Book Award. We congratulate our three nominated authors and look forward to hearing the award results the week of April 14th. While we recognize some progress in our country in terms of gay and lesbian rights, Moon at Nine is a sobering reminder that being gay or lesbian is still a criminal offence in many countries in the world, and for many, the penalty is death. Ellis has given us this reminder with yet another beautifully written story, the love story of Farrin and Sadira. Rebecca Bender grew up in small-town eastern Ontario where her artistic mother let her daughter draw and paint alongside her at an early age. Even as a young child Rebecca took her art seriously, looking up to illustrators like the expressive Robin James (the Serendipity Series, 1974–) and the humorous Dr. Seuss. Rebecca maintained her interest in art as she grew up, eventually graduating from the Ontario College of Art and Design where she received the 2003 OCAD Medal for Illustration. Since then she has worked with a range of talented designers and art directors in a variety of graphic design positions—all of which, she says, has helped to develop her illustration work. Her big break as an author/illustrator came in 2011 with the publication of the picture book Giraffe and Bird, which won the OLA Blue Spruce Award in 2012. The following year its sequel, Don’t Laugh at Giraffe, was an honor book for the same award. Today Rebecca illustrates, writes, and works as an art director and graphic designer in Burlington, Ontario. 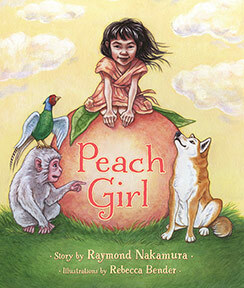 In her most recent book, Peach Girl by Raymond Nakamura (May 15, 2014), she brings to life a feisty young girl who sets off through the countryside of Old Japan to find an ogre along with three friends, the humorous and expressive Monkey, Dog, and Pheasant. When did you first know you wanted to write and illustrate picture books? Your first two books, Giraffe and Bird and Don’t Laugh at Giraffe, have both received a very positive reaction. What was your favourite part about your journey with those two books? I would have to say that meeting all the children, teachers, parents and book sellers that have enjoyed my books and shared with me their stories and enthusiasm has been the most rewarding part. I didn’t intend for these books to teach lessons, but it’s nice to hear that they have helped in little ways. (One librarian asked me to sign a book for her granddaughter, who was very shy and really connected with Don’t Laugh at Giraffe; her inscription went, “Don’t be afraid to get your hooves wet”). With Peach Girl, you’re illustrating someone else’s story for the first time. How does that experience compare to being an author-illustrator? It was a nice change to illustrate someone else’s story with Peach Girl because I was able to put all my attention on the art, not thinking about re-writes and corrections, etc. It’s also a refreshing exercise to bring characters to life that someone else has created in words first — it gives me the chance to try to see things through another author’s eyes, creating things from their imagination. 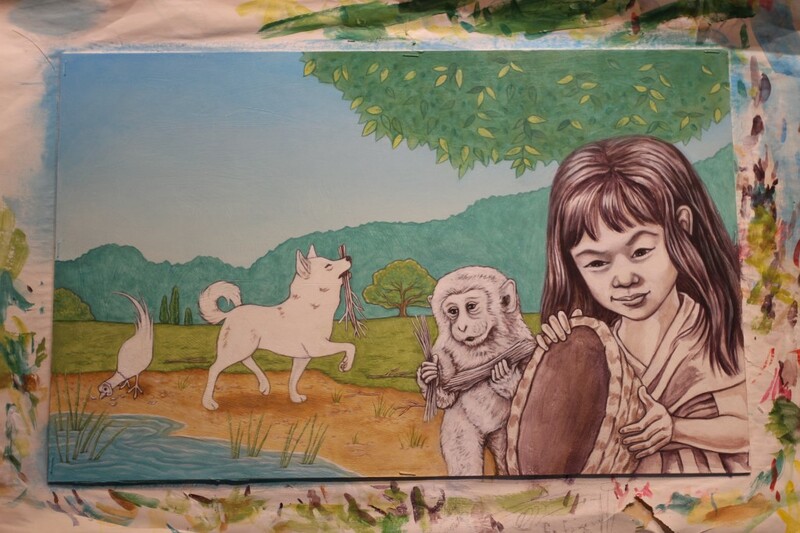 Were the Japanese landscapes and animals in Peach Girl new territory for you as an artist? How did you meet that challenge? I haven’t done a lot of historically-based illustrations, so it was a fun challenge to research and find the visual reference I needed to bring authenticity to this story. Which Peach Girl character was your favourite to paint? Why? I would say the dog was the most fun for me to paint. We had a lot of dogs growing up and I love how expressive they can be with their postures and body language—they are so emotional too—you can always tell how a dog is feeling. What is it like to balance illustration, your day job, and two very young children? 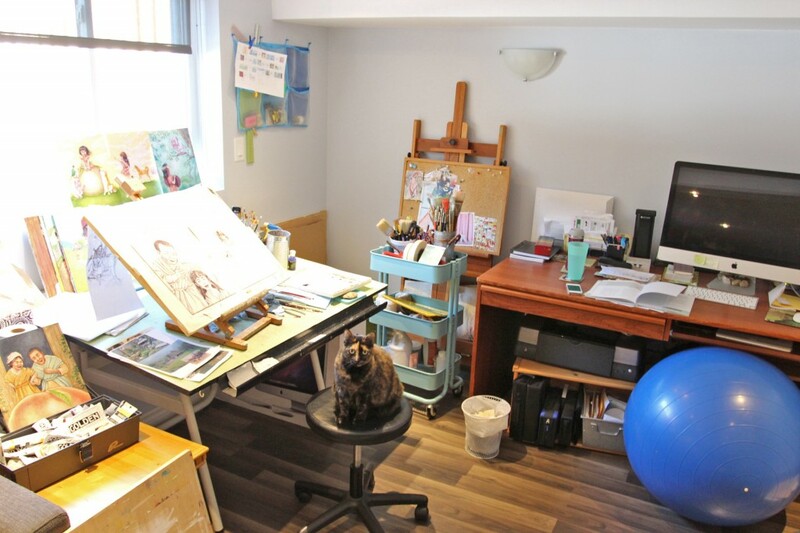 It is challenging to find a good balance, especially because my studio/office is at home. I’m lucky that my day job (graphic design) works well with illustration in that they are closely related; doing one strengthens my skills in the other. Can you share any advice for other aspiring illustrators? For other aspiring picture book illustrators, I would say to get involved in the industry as much as possible, and continually push yourself by working on new portfolio and promotional pieces. Make sure they reflect the style and range of subjects you’d like to be asked to do for someone else. Don’t make the art director guess what you’re capable of—show him or her.